When you run a Vehicle Health Report, Ford Motor Company may collect your cellular phone number (to process your report request) and diagnostic information about your vehicle. Certain versions or updates to Vehicle Health Report may also collect additional vehicle information. Ford may use the vehicle information it collects for any purpose. If you do not want to disclose your cellular phone number or vehicle information, do not run the feature or set up your Vehicle Health Report profile at www.SYNCMyRide.com. See www.SYNCMyRide.com - Vehicle Health Report Terms and Conditions, and Privacy Statement - for more information. Note: SYNC Services requires activation prior to use. Visit www.SYNCMyRide.com to register and check your eligibility for complimentary services. Standard phone and message rates may apply. Subscription may be required. 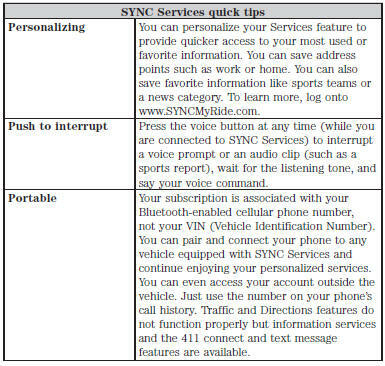 You must also have the active SYNC Services Bluetooth-enabled cellular phone paired and connected to the system in order to connect to, and use, SYNC Services. See Using SYNC with your phone for pairing instructions. Note: This feature does not function properly if you have enabled caller ID blocking on your mobile phone. Make sure your mobile phone is not blocking caller ID before using SYNC Services. Note: The driver is ultimately responsible for the safe operation of the vehicle, and therefore, must evaluate whether it is safe to follow the suggested directions. Any navigation features are provided only as an aid. Make your driving decisions based on your observations of local conditions and existing traffic regulations. Do not follow the route suggestions if doing so would result in an unsafe or illegal maneuver, if you would be placed in an unsafe situation, or if you would be directed into an area that you consider unsafe. Maps used by this system may be inaccurate because of errors, changes in roads, traffic conditions or driving conditions. Note: When you connect, the service uses GPS technology and advanced vehicle sensors to collect the vehicle’s current location, travel direction and speed to help provide you with the directions, traffic reports, or business searches you request. Further, to provide the services you request and for continuous improvement, the service may collect and record call details and voice communications. For more information, see SYNC Services Terms and Conditions at www.SYNCMyRide.com. If you do not want Ford or its service providers to collect the vehicle travel information or other information identified in the Terms and Conditions, do not activate or use the service. SYNC Services uses advanced vehicle sensors, integrated GPS technology and comprehensive map and traffic data, to give you personalized traffic reports, precise turn-by-turn directions, business search, news, sports, weather and more. For a complete list of services, or to learn more, please visit www.SYNCMyRide.com. 2. When prompted, say “Services”. This initiates an outgoing call to SYNC Services using your paired and connected Bluetooth-enabled cellular phone. 3. Once you are connected to the service, follow the voice prompts to request the desired service, such as “Traffic” or “Directions”. You can also say “What are my choices?” to receive a complete list of available services from which to choose. 4. Say “Services” to return to the services main menu or for help, say “Help”. 2. Scroll until Services appears in the display. 3. Press OK to confirm and enter the Services menu. The display indicates the system is connecting. 4. Press OK. SYNC initiates the call to the Services portal. 5. Once connected, follow the voice prompts to request your desired Service, such as Traffic or Directions. You can also say “What are my choices?” to receive a complete list of available services from which to choose. 6. To return to the Services menu, say “Services” or for help, say “Help”. 1. When connected to SYNC Services, say “Directions” or “Business search”. To find the closest business or type of business to your current location, just say “Business search” and then “Search near me”. If you need further assistance in finding a location you can say “Operator” at any time within a Directions or Business search to speak with a live operator. You may also be prompted to speak with an operator when the automatic system has difficulty matching your voice request. The live operator can assist you by searching for businesses by name or by category, residential addresses by street address or by name or specific street intersections. Operator Assist is a feature of your SYNC Services subscription. For more information on Operator Assist visit www.SYNCMyRide.com/support. 2. Follow the voice prompts to select your destination. Once your destination is selected, your current vehicle location is uploaded and a route based on current traffic conditions is calculated and sent back to your vehicle. After the route download is complete, the phone call is automatically ended. You then receive audible and visual driving instructions as you travel toward your destination. 3. While on an active route, you can select or say “Route summary” or “Route status” to view the Route Summary turn list or the Route Status ETA. You can also turn voice guidance on or off, cancel the route or update the route. If you miss a turn, SYNC automatically asks if you want the route updated. Just say, “Yes” when prompted and a new route will be delivered to your vehicle. 1. Press and hold the phone button on the steering wheel. 2. Say “Good-bye” from the SYNC Services main menu.